A fantastic value base from which to explore the delights of Paris, Hotel Louison is a friendly and elegant boutique hotel in a great location. 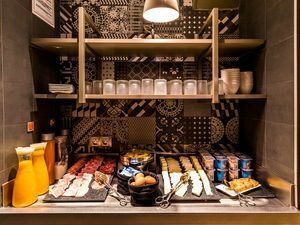 One of our favourite hotels in terms of the warm welcome and extremely helpful reception staff, the rooms at the Louison are more spacious than other hotels of this grade in Paris and you are guaranteed a stress-free and enjoyable stay. In the sixth arrondissement, a short walk from Montparnasse and the beautiful Luxembourg station, there are six metro stations all within five minutes of the hotel, offering excellent links to the city’s main attractions. 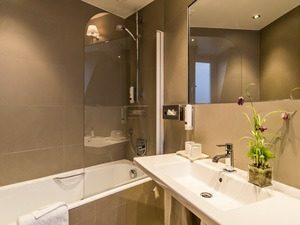 The hotel is located in a quiet street just off the bustling Boulevard du Montparnasse, and each room has double-glazed windows to ensure a peaceful night’s sleep. For those arriving by car, the hotel has a private car park which can accommodate two cars only, and must therefore be booked in advance. The hotel’s most unique and enjoyable feature is its traditional French “aperitif” every day at 6pm. Wine and local cheesed and meats are laid out in the cosy breakfast room for guests to help themselves and relax after a long day of sight-seeing. Also available is a 24 hour reception, a comfortable sitting room, a selection of daily newspapers and breakfast is served every morning until 11am. The hotel boasts 42 rooms, across three categories. 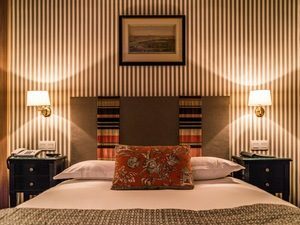 Tradition rooms are excellent value for a short stay, measuring 16 square metres and equipped with a double bed, an en-suite with a large shower, toiletries and a hair-dryer, a television with international channels, a mini-bar and air-conditioning. The more spacious Prestige rooms have a king-sized double bed or two twin beds, an en-suite with a bath or shower, and tea and coffee-making facilities as well. The Executive rooms are ideal for families, as they are equipped with a double and single bed.